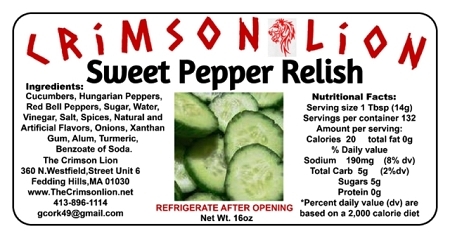 l Sweet Pepper Relish- 16 oz. Home > Shopping Store > Jams & Condiments Shopping Cart > Sweet Pepper Relish- 16 oz. Sweet Pepper Relish - 16 oz. and is popular on brats, kielbasa, hot dogs, burgers, etc.